This book is an essential edition for any serious student of Christian Science. 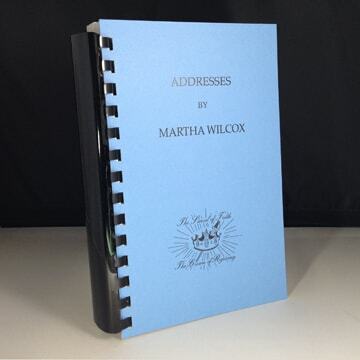 Some of the articles included are: “The Life Story of Martha W. Wilcox, CSB,” “Reminiscences of Mary Baker Eddy,” “Body” (1st and 2nd articles), “Definition of Intelligence,” “The Power of a Right Idea,” “Overcoming by Obedience,” and“Supply” just to name a few. The book is 434 pages and is a beautiful blue paperback edition. Martha Wilcox was one of Mrs. Eddy’s most faithful students. In the spring of 1908, Mrs. Wilcox was under our Leader’s personal instruction for seven weeks. During this period she learned two fundamental lessons in Christian: 1) that mental malpractice had to be handled as something entirely within one’s own thinking; 2) that there is only one spiritual creation, and that what are called “the objects of sense” are actually spiritual ideas. Mrs. Eddy taught Mrs. Wilcox the need to be “faithful and orderly” with the “objects of sense” so that their true spiritual substance could be progressively unfolded. At Chestnut Hill, Mrs. Wilcox learned that Christian Science had to be practically demonstrated in all the day-to-day household duties she was required to perform. At Chestnut Hill there was never any chattering about Christian Science; it was something to be lived and proved. Mrs. Wilcox later went through the 1910 Normal Class, taught by Bicknell Young, and then returned to Kansas City, Missouri, where she was active as a practitioner and teacher. At one point, the Board of Directors wrongly threatened to dismiss her as a teacher and take Mrs. Wilcox’s association from her (an action that they have engaged in often to the harm of the Christian Science movement). She went to a hotel and to her room, working and praying for three days. During this time her sister left meals outside Mrs. Wilcox’s door. When Mrs. Wilcox emerged from her room, with her face radiant, her sister could see that the problem had been met. The Board of Directors immediately telegraphed her not to come, as all the charges had been dropped. All of Mrs. Wilcox’s writings on Christian Science bring out clearly what she learned from our Leader at Chestnut Hill: that there is one divine consciousness, God, and one divine, spiritual creation. Mrs. Wilcox’s teaching was of the highest order, and we are fortunate that it has been preserved in book form, which is available from the Plainfield Church.